Real Estate Balanced Scorecard for Excel allows to use predefined metrics to measure the performance of Real Estate assets of the company, providing top managers with clear view over real estate assets, their current and planned performance. 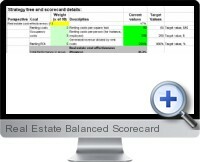 Also, the Real Estate Balanced Scorecard for Excel provides necessary indicators to benchmark real estate assets. This KPI system will make the process of real estate management easier as will represent a key manager a simple dashboard with necessary indicator metrics.